The blooms of this species resemble tiny fans, unfolded against the summer heat. 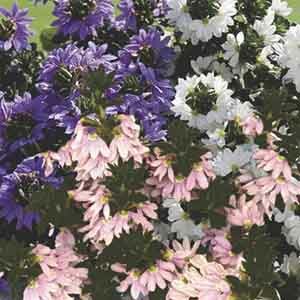 Perennial in its native Australia, fan flower is a favorite for use in annual combinations elsewhere. Very heat tolerant. Very easy to grow in virtually any location. Best in fertile, well-drained soil. Water as needed to keep soil evenly moist, especially in hot weather. Trim back as needed.